Work from home administrative jobs have skyrocketed in popularity the last few years. Why? My guess is because, with a computer and internet connection, you can do just about anything at home as you could in an office. You can send faxes online. You can answer phones. You can “meet” with co-workers and clients over Skype or Google Hangouts. You can even collaborate with others with Google Docs, InVision or countless other online tools. That’s why many companies are embracing the remote administrative assistant to help them get through their days. If you’re ready to get out of the office but still put your administrative experience and skills to good use, there are a lot of flexible options out there — but you have to know where to look. Here’s a rundown of 6 ways to find more work from home administrative jobs (so you can get out of the office and into your home office). They say variety is the spice of life and when it comes to work from home administrative jobs, you can definitely find plenty of variety on Upwork. 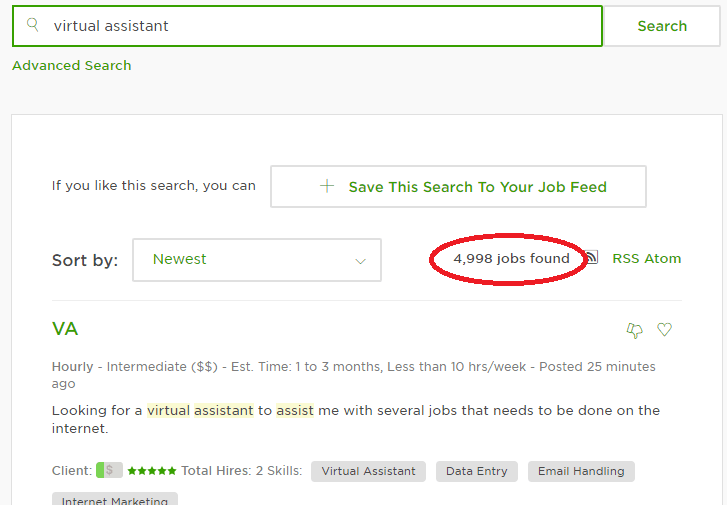 A quick search of “Virtual Assistant” on the world’s largest freelance marketplace returns nearly 5,000 gigs. If you’re not familiar with the term, a Virtual Assistant (VA) is someone who performs any number of clerical and administrative tasks from a remote location. Tasks can include anything from answering phone calls, responding to emails, online research, data entry, social media management — it really just depends on who you’ll be assisting. Bloggers, solopreneurs, ecommerce store owners, and busy professionals commonly use VAs to help them get more done in a day. If you’d like to try your hand as a remote administrative assistant, sign up as a freelancer for Upwork. With thousands of jobs posted, you can try out a gig or two to see if you actually like working remotely (it’s not for everyone). If so, great! If not, no problem. You can even turn the work from home administrative jobs on Upwork into extra income generators if you’re not ready to commit full-time to freelancing. It can take some time to get your first client — don’t get discouraged! Upwork is a great source of literally thousands of work from home administrative jobs. If you’re just starting out as a VA, this just may be the easiest place to gain some experience. Another source of work from home administrative jobs for beginners is Fancy Hands. What is Fancy Hands, you ask? It’s an online platform that crowdsources administrative-type tasks. When you sign up as a Fancy Hands Virtual Assistant, you (and all the other Fancy Hands VAs) have access to a general dashboard of tasks. All tasks are claimed on a first come first served basis. So, you never know what (or how many) jobs you might find waiting for you when you login. At Fancy Hands you are paid per task. Tasks may pay anywhere from $2.75 to $7.00. Keep in mind each task should (at most) take 15-20 minutes to complete. So, even if you claimed only $2.75 tasks and they each took 20 minutes, you’d still be making $8.25/hour — but that’s worse case scenario. I worked as a Fancy Hands VA for about six months. All in all, it was a pleasant experience, and I certainly wouldn’t hesitate to do it again! There is the opportunity to move up in Fancy Hands. You can get paid to review other VAs’ work and even become a manager (the manager jobs are hourly employee positions). What’s nice about Fancy Hands is the fact you can login in any hour and almost always find work available. As far as work from home administrative jobs, Fancy Hands is perfect for those looking for plenty of flexibility. If working as a freelancer on Upwork or as an independent contractor on Fancy Hands doesn’t sound like a good fit, head on over to Indeed to search for work from home administrative jobs. On Indeed, you’re likely to find more job listings for employee-based VAs and remote admin assistants than most anywhere else. If you’re not familiar with Indeed, it’s a job search engine. 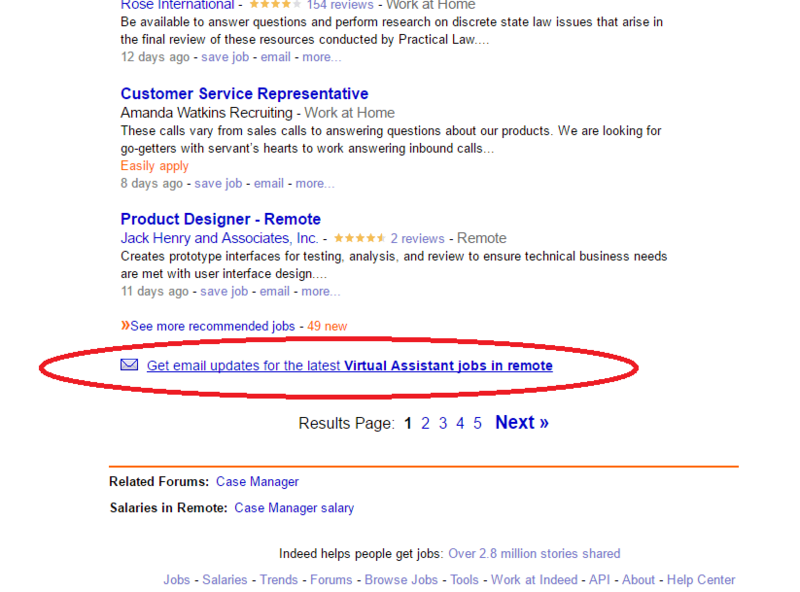 Indeed scours the web to bring job listings from tons of different sites into one easily-searchable database. When looking for work from home administrative jobs on Indeed, you’ll want to try a few different searches to get the most results. It’s a good idea to try a number of different “What” and “Where” keyword combinations — each one might bring up different jobs. Or, if you prefer, you can create a custom job alert. Scroll down to the bottom of any search page and you’ll see the option to get “email updates.” When you do this, Indeed will send you an email every time a new job is posted that matches your search terms. Since Indeed is a job search engine that scrapes the web for listings, it’s also a good idea to visit the original job post when possible. Often, the original job post contains specific instructions on how to apply. Even though Indeed has the giant orange button that says “Apply Now” you aren’t officially applying to the job through the actual posting. Instead, Indeed is sending in an application on your behalf — this can definitely turn off some employers. 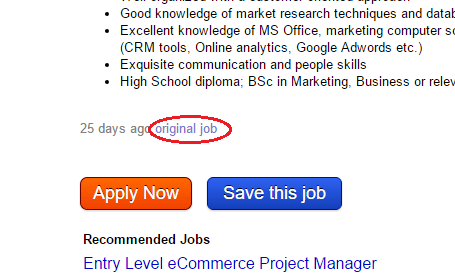 Whenever possible, visit the link to the original job and apply that way! There are a growing number of companies out there that provide virtual receptionist services. This means there’s also a lot of opportunities to work from home as a virtual receptionist. As far as work from home administrative jobs, working as a virtual receptionist is definitely phone heavy — so be sure to keep that in mind. If you have little ones in your care or an overly excited dog at home, it may interfere with your ability to answer calls in a noise-free environment. Remember, these companies aren’t always hiring — so it’s a good idea to check their “careers” page regularly for current openings. As a virtual assistant, you’ll get to exercise your administrative chops on a daily basis — you really never know what it is you might be tasked with. There are a number of virtual assistant companies out there that contract with VAs, like you, and put you to work for clients. Some VA companies will pair you up with a client or two (known as a dedicated VA) and others will divvy out work to assistants as requests come in from clients. It’s important to decide whether you would prefer to work one on one with a client or two or mix it up by working with any number of clients in a given week. Either way, when it comes to work from home administrative jobs, there is definitely a lot of variety at the various virtual assistant companies. The onboarding process at virtual assistant companies can be lengthy. You might have to go through a number of stages and tests to demonstrate your administrative prowess. However, when looking for work from home administrative jobs, virtual assistant companies are often hiring (making it much easier to find work). The average Virtual Assistant and Virtual Receptionist company pays somewhere between $10-$12 hour. As a Fancy Hands Assistant, your earnings will probably be pretty similar. On Upwork, you’ll find gig rates vary quite a bit. There’s the potential to earn more than $12/hour (but there’s also a good chance you’ll earn less than that, too). Remember, Upwork also takes a 10% cut of your earnings. Wouldn’t it be great to cut out the middleman? No fees. Complete autonomy. Set your own pay rate. Choose who you work with. Well, you can when you start your own Virtual Assistant business — and it’s easier than you might think. A great place to start is at the very beginning. The ecourse, 30 Days or Less to Virtual Assistant Success, is designed specifically for brand new VAs who want to get their own business up and running within a month’s time. The course creator is Gina Horkey. She built a successful freelance writing and virtual assistant business from the ground up and was able to earn more than $4,000 a month working part time (when working full time, she’ll earn more than triple that each month). But don’t just take my word for it — Gina is pretty transparent when it comes to earnings, and she will show you her income reports at various stages to give you a good idea of what you could earn as a brand new VA business. Instead of spending time each day tracking down and applying to work from home administrative jobs, why not create your own? 30 Days or Less to Virtual Assistant Success will teach you a proven method to starting your own VA business from scratch. The basic course price starts at just $39 and comes with a 30-day money back guarantee. Work from home administrative jobs are expected to grow as more and more professionals, business owners and solopreneurs outsource their to-do lists to remote assistants. Now’s the perfect time to move your administrative skills from the office and into your home office (and earn a good income without the commute!). Have any questions? Please feel free to leave them in the comments below. If you prefer, you can always email me at ashlee@workfromhomehappines(dot)com — I’m happy to help any way I can! This post may contain affiliate links. Read my disclosure statement for more information. Great resources Ashlee. Thanks so much for putting this together and sharing it with us. 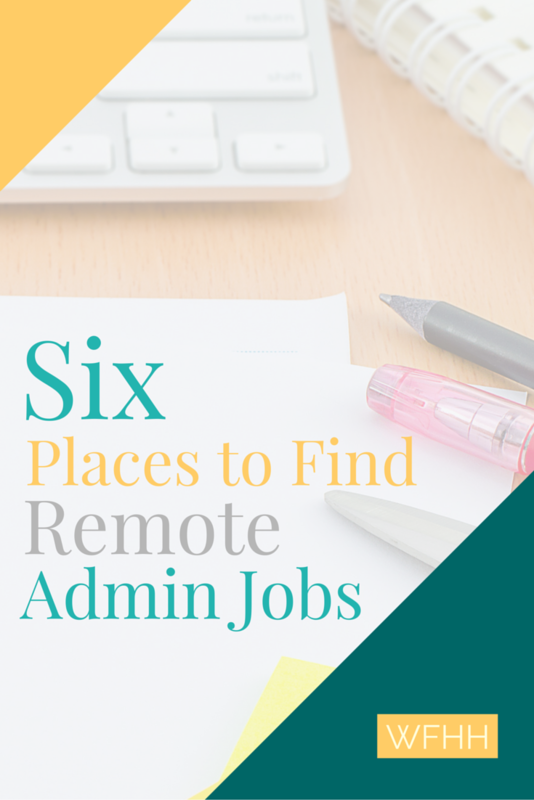 This is going to help a lot of people who are looking for admin jobs to do from home. You know I’m passing this on!